Chef Charity Morgan is channeling her skills as a Le Cordon Blue certified chef, creating plant-based meals for NFL players, athletes, and celebrities. 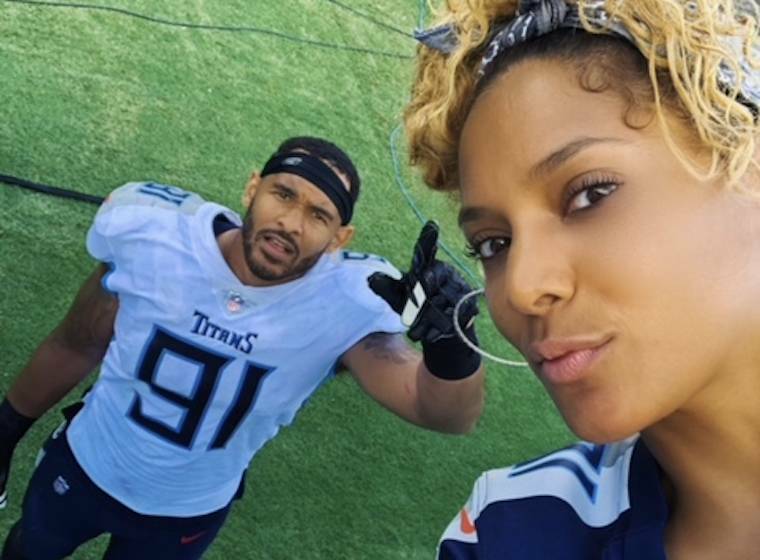 Her husband Derrick Morgan, a Tennessee Titan linebacker, was her impetus: he went vegan before she did. VeggieHappy’s co-founder Johanna McCloy recently talked with Chef Charity Morgan about her path to plant-based cooking, her approach with NFL athletes, and some of her favorite plant-based foods and recipes. This is part one of a two-part feature. VH: Congratulations on your success! Fifteen Tennessee Titans on your plant-based meal plan? That’s fabulous. Is your husband Derrick still vegan? Chef Charity: Absolutely! He went vegan before me. That’s what I’ve had to correct on pretty much every podcast that I’ve done. People ask me, “so how did you get Derrick on board,” and I’m like . . . um, Derrick got ME on board. I love it because my husband lost a lot of things when he chose this diet. He lost inflammation in the body, his face is not as pudgy, and he lost a lot of stress, but his strength didn’t leave. He’s still as strong as an ox, he’s still defined and stacked on the build. More and more NFL players, NBA players, and so forth, are choosing to be vegan. It’s debunking that manly notion, and that madness of what some people think of vegans. They’re not tree huggers or weak or little surfer people. What initially prompted Derrick to become vegan? Derrick, being the person that he is, did tons and tons of research, which all pointed to lower inflammation, faster recovery, sleeping better . . . all these things. He was like, “okay, sign me up!” And he started. It was maybe a month later that I followed, I said you know what? I think I can do this with you, because I was having digestive issues. It’s been all downhill from there. That’s great. Were you already trained as a chef at Le Cordon Bleu at that point? I trained 15 years ago. I’ve been a chef for 15 years and I’ve gone the whole chef route. I’ve worked in restaurants, I’ve done catering, I’ve done all of that. Culinary school was probably one of the hardest things that I did, but it gave me my credentials so people would take me seriously. I needed that, because I came from a whole different world in L.A. doing modeling and commercials. I knew people wouldn’t take me seriously unless I did the work. How was your experience of culinary school? I watched all my friends and all my classmates drop out of culinary school, because it’s probably, by far, one of the hardest things people can go through. I tell people, culinary school is like a whole bunch of instructors and chefs that are in competition for who can be the meanest. They degrade you. You have to have really thick skin to keep up with them. It’s just horrible. I went through it, you know, I did my time. I just took what I learned from culinary school and I applied that to my plant-based role later, by changing the ingredients. I noticed that you reference yourself as plegan, instead of vegan. Yeah. Don’t put me in a box! No two vegans are the same. Some people still eat honey but have otherwise been vegan for 30-40 years; they’ve never eaten eggs or beef or chicken or dairy, but they eat honey because they want the minerals. Think about that, 30-40 years, when it was not easy, and they didn’t have Beyond Meat and Gardein burgers and all this stuff. They pretty much were eating tofu and real vegetables. Who are we to talk down to them because these are the choices that they made? They’re the pioneers. So you know what? I don’t want that pressure. I don’t want it for myself, and I sure as hell don’t want it for my athletes. I’m willing to meet any athlete wherever they are on their journey. Some of my athletes will tell me, I want to give up everything, even cheese, but I’m just not ready to give up this, whatever it might be, quite yet, because I feel like my body needs it. And I say okay. How many NFL players are consistently eating your plant-based meals each day? It’s still my top 15 guys, and I’m super sad, because this is the NFL and two things can happen: one is that players can get injured on the field . . . . so I have two players that are on IR or Injured Reserve, and then I have two players in the last couple of weeks that got released from the team. I just got news from one’s wife, she texted me today, and said that they are with the New York Jets. So it’s so many moving parts. I have four guys from last season that hit free agency, and those four guys are somewhere else on another team . . . but overall, I’ve touched 20 plus players with this plant-based journey. I actually cook for retired players too. Like Cortland Finnegan who is a retired Titan, he played for them for many years. He’s on the meal plan. And I also have some celebrities that I cook for but I don’t talk about them, because I don’t want to bring too much paparazzi. The celebrities I cook for are huge. The paparazzi sit in front of their house. I have an assistant now because it got to be a lot of work. I don’t want to turn any players down.